Another week closer to our fateful trip to West Palm Beach. Amidst the growing panic anticipating this life-changing move and event, we’ve decided it’s necessary to make a pre-emptive trip to WPB to secure an apartment to live during our stay. So, I have four appointments to tour apartments and am currently searching for a caretaker via an online registry of babysitters and nannies to interview as well. So, March 30th, you’ll see me flying south for the weekend. Drew has become quite popular being the subject of many requests to come visit schools and organizations. Last week, we were invited to visit the Sturgis Elementary School. It marked the first time I used the new ramp on my truck completely by myself. I am already improving as I didn’t sustain any injuries this time unlike the first time I attempted to unroll it. I still have the bruise on my knee. Drew as at first disgruntled due to my disappearing from view momentarily while he wheeled up front, but after the assembly, some kids got to hang back and they played ball with Drew. 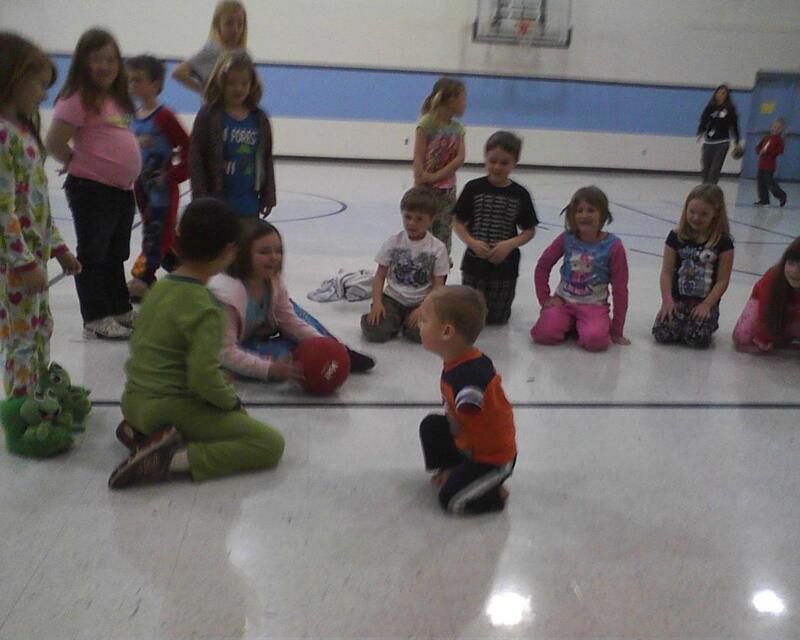 Drew hopped around and kicked the ball to all of the kids as they all ran around happily playing with Drew. We also visited the Morganfield First Baptist Church youth group meeting to introduce Drew. Morganfield First Baptist Church donated 10 baskets to our auction. As if that wasn’t enough, they are donating more! Drew had a great time and all of the members were enamored by Drew. I was slightly embarrassed as Drew chose the violent route of pretending to mow down everybody with his new water gun that Wendy, the director, had gifted him. Why couldn’t he have pretended to be a goodwill ambassador to some third world country? It would have been more evident that he truly is a saint! Then, this morning, Channel 14 WFIE news visited us at Morganfield Elementary. Brett Hoffland and I chatted about Drew and his TAR Syndrome. Drew was videoed in the classroom, on his wheelchair and in the gym. It was in the gym that I was most excited to see Drew interact with his peers. The interview went well and I was delighted to see how Drew acted in class. I had volunteered once in his classroom and he was not as cooperative while I was there so volunteering at school would not be a part of our close future. But, I always wondered what he’s truly like as I hear so many good things about Drew from all of the school staff. I’m trying to be sensitive to the fact that each piece has to be short and concise, but I wish they would have included information, both on TV and online, about the Drew Walking Tall Charity Event. So, if you have discovered my blog after watching us on the news, please visit my Drew Walking Tall page for more information about this event. And, you can read our story as presented by WFIE here. Aside from that, I learned today that Drew’s shots are not up to date so I must take him to get his shots. That will not be fun for either of us – less so for him of course. Recently we learned that Drew has obstructive sleep apnea via a sleep study that was performed at Vanderbilt in January. We have been referred to an ENT in Nashville for a consult but the earliest they could schedule us is April 6th which doesn’t leave us much time to schedule a tonsilectomy if that is what they decide to do since we are moving to WPB a few weeks after that. If it takes a two month window to schedule a consult, I can only imagine how long it will take to schedule a surgical procedure. While I don’t look forward to yet another surgical procedure, it is the lesser of two evils when you think about potential of Drew stopping breathing while under anesthesia during his leg surgeries. I’m calling daily and on the waiting list to be squeezed into a cancellation…if that ever happens. I’m considering going to Evansville or maybe even Louisville, but it’s always uncomfortable taking Drew to a new set of unfamiliar doctors who don’t have a good grasp of Drew’s history. Tuesday we are going to visit Drew’s urologist to follow-up on an issue that I’m sure 16-year-old Drew will be very mad at me for talking about online so I won’t say why. But, lets hope that it doesn’t involve anything surgical too!